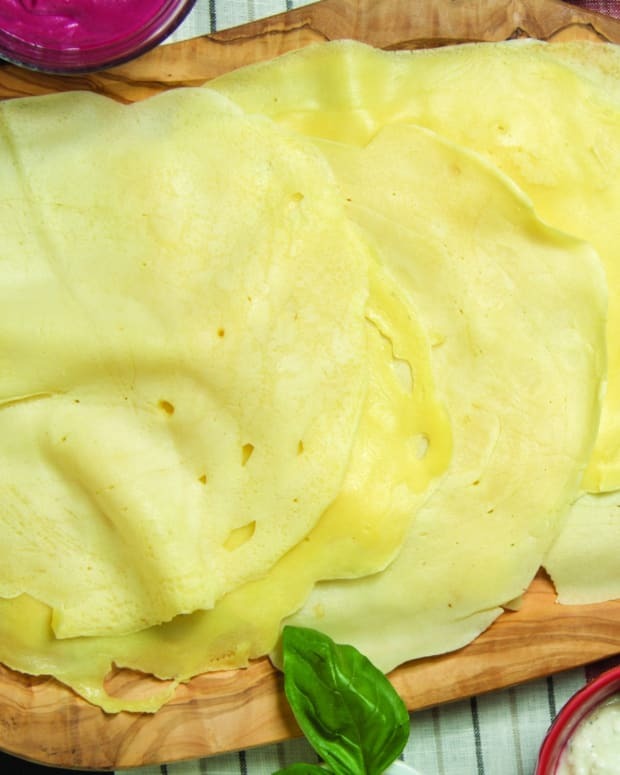 Use this savory crepe recipe and these ideas for fillings as a starting point and then make your own varieties. 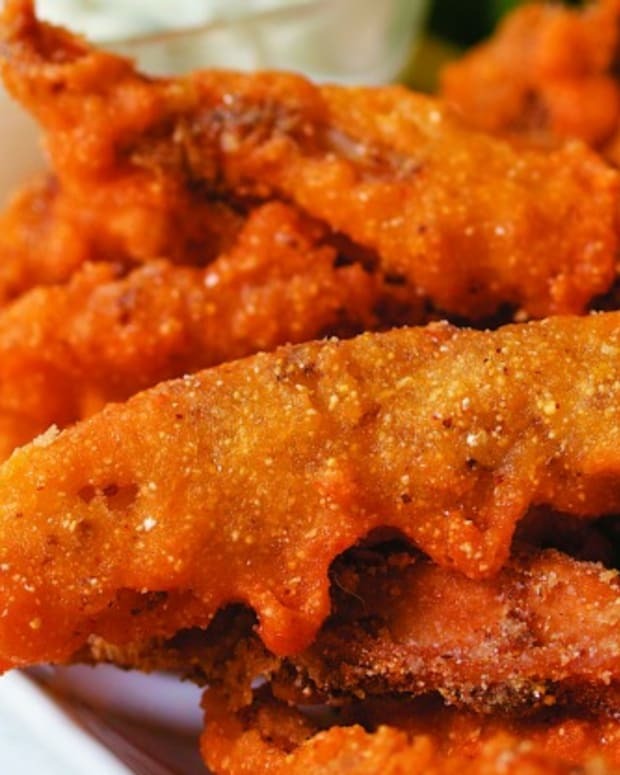 Add curry powder to the batter if filling with Aloo Gobi, use chopped herbs in the batter for the Spinach filling, and use your imagination for more great ideas. I kept the batter parve too so you can even experiment with meat fillings. In a blender, combine the flour, almond milk, seltzer, eggs, oil, sugar and salt (if adding any other spices or herbs do so now). Let stand at room temperature for 30 minutes or place in fridge for a few hours or even overnight, let sit out for 20 minutes before ready to use. Lightly spray an 8-inch cast iron or crepe pan with cooking spray and place over medium-high heat until hot. Pour ¼ cup of the batter into the pan and tilt the pan to cover the bottom evenly (it might take a few tries, but it gets easier). Cook until the bottom is golden brown, about 1 minute. Flip with a fork and cook on the other side until golden, remove to a plate. Repeat with the rest of the batter spraying the pan as needed, maybe every other crepe. Stack them on the plate, they won't stick together. Makes 12 blintzes. At this point you can refrigerate (will stay for 2-3 days) or even freeze them, but it is better to place between wax paper if you are going to do that. If using the same day prepare your filling (ideas below) and preheat oven to 350. Assemble: Place 1 blintz spotted side up on a work surface. 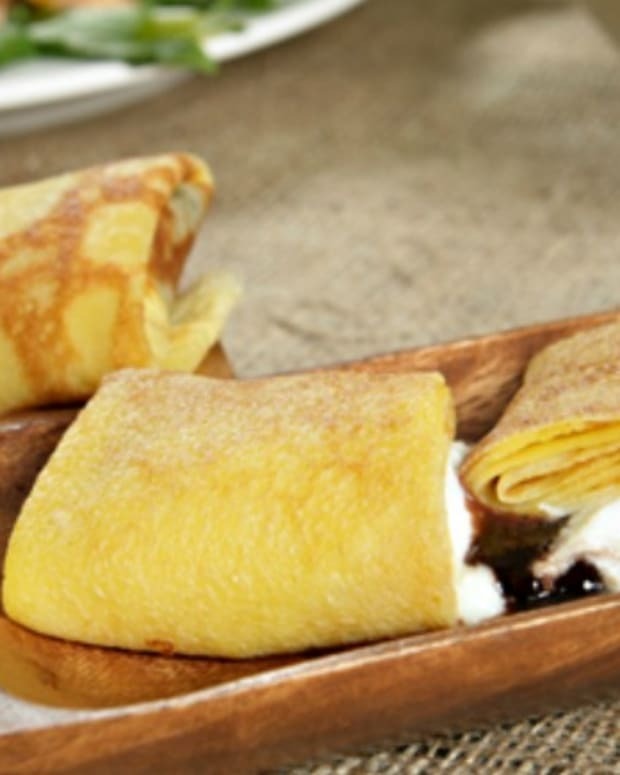 Place about 2 tablespoons filling just below the center of the blintz, fold up the bottom then the two sides and then roll up from the bottom, covering the filling. Place on the baking sheet, seam side down. 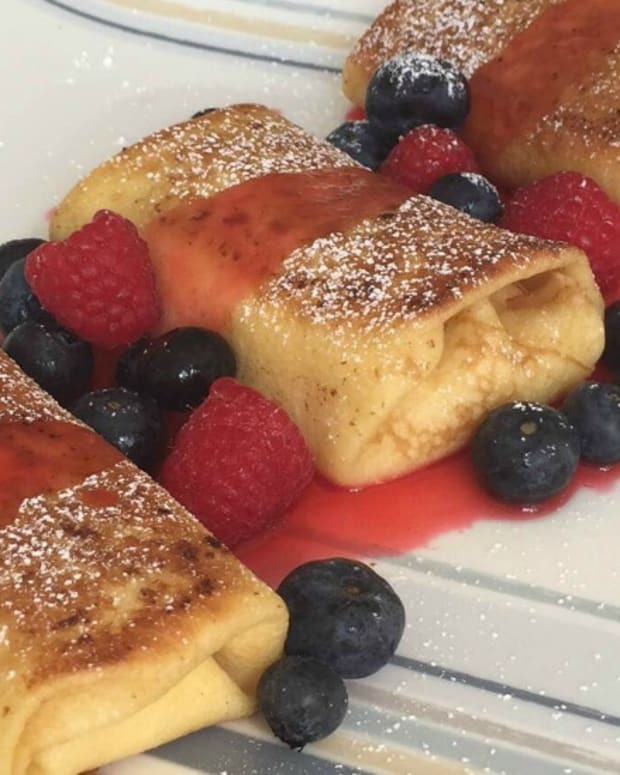 Fill and fold the rest of your blintzes and lay on the pan. Bake in oven about 10 minutes until they are hot and crispy. 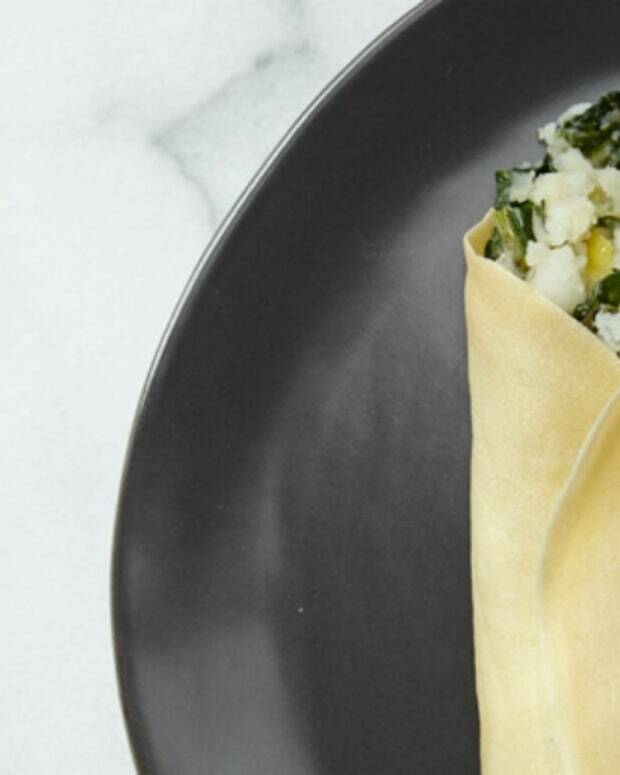 Spinach, Feta and Oven Roasted Tomatoes - use chopped fresh spinach and place it raw in the crepe, sprinkle on feta and oven roasted tomatoes. 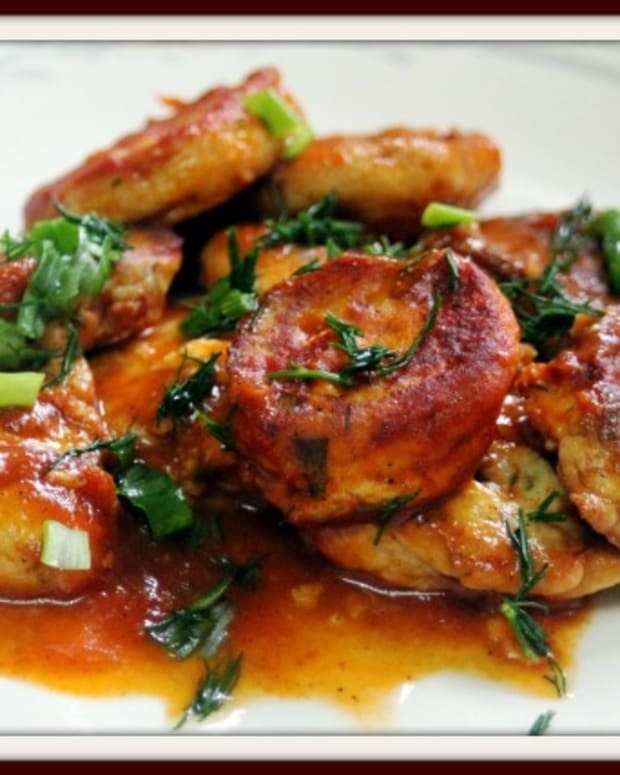 Aloo Gobi - use this recipe and dip in a mango chutney if desired. Apple, Brie and Onion Jam - Prepare caramelized onions and puree them to make an onion jam. 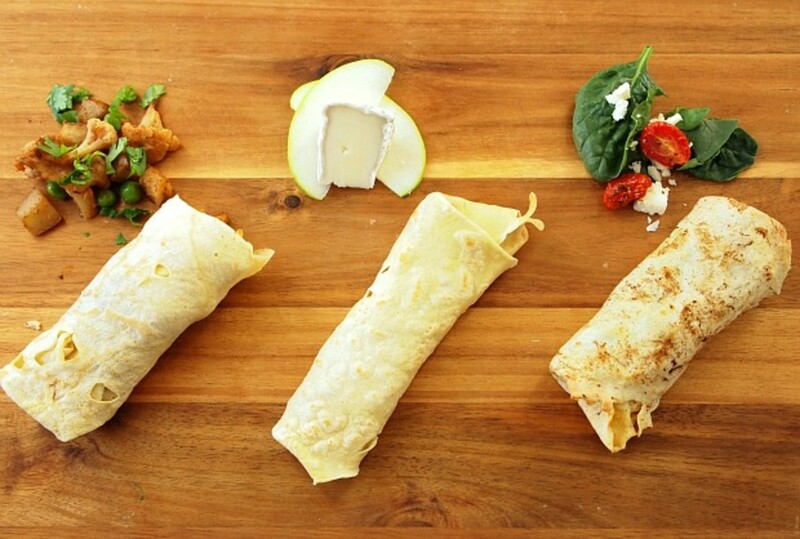 Spread on crepe, top with thin slices of green apple and Brie cheese.